As families across the country gather to celebrate the holidays and ring in the new year together, I invite everyone in our great Girl Scout Movement to join me in recognizing and celebrating the courageous Girl Scout alumnae who serve in the armed forces. 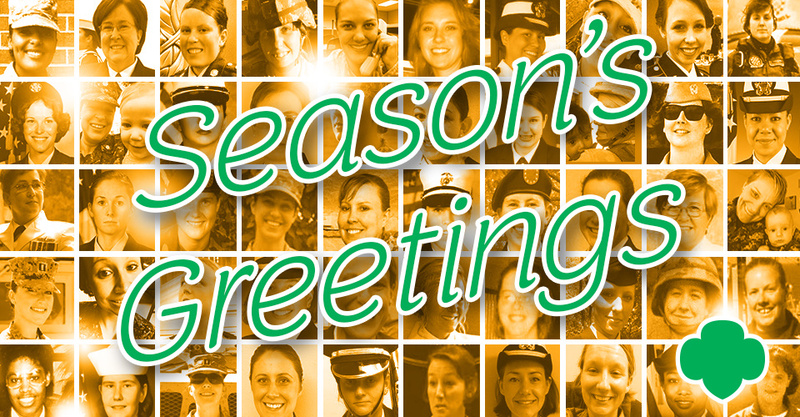 These patriotic women make incredible sacrifices to serve our country day after day, and are often unable to be with their families and loved ones during the holidays. Let’s extend our thanks to these amazing active servicewomen in the U.S. Army, Navy, Air Force, Marines, and Coast Guard. Many of these alumnae are also Gold Award Girl Scouts who joined the armed forces at a rank higher than their peers because they earned the most prestigious award in the world for girls. They have all shown the courage, confidence, and character to lead like a G.I.R.L. (Go-getter, Innovator, Risk-taker, Leader)™wherever they are stationed across the globe. Their patriotism, selfless duty, and commitment to making the world a better place truly represent the essence of the Girl Scout Promise and Law. For all they do for us every day to keep our nation safe and secure, we owe them our deepest gratitude. Note: For the families of our servicewomen and -men on active duty, these tips may help you navigate challenging times with children who are unable to celebrate the holidays with a loved one who is deployed.